I love photographs depicting the tops of bridges or very tall buildings, when the rest of the edifice is obscured by clouds. Since I am not inclined to take my camera to great heights or wait for clouds to enshroud a favorite bridge or building, I painted my own misty environment and used sepia ink to draw my fantasy skyline. 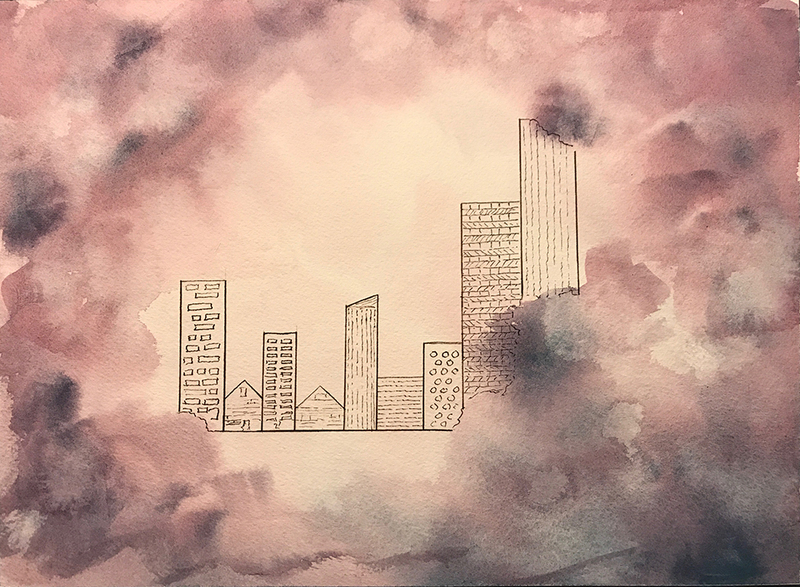 This entry was posted in Personal Stories and tagged abstract art, artistic process, clouds, creativity, drawing, painting, pen and ink, skyline, visual arts, watercolor. Bookmark the permalink. I love the clarity of the city rising from the ghostly clouds.